Another Carolinas artist is shining on BET's 106 & Park Freestyle Friday competition. Charlotte rapper Yung Nut won this evening, making that five wins in a row in the weekly battle of MCs. Yung Nut (what a name, right) can now put his feet up for a few months because the fifth win qualifies him for the March Mayhem tournament that takes place next year. About ten or so of the top rappers from the past year's Freestyle Friday battles will face-off in a tournament bracket-style competition for several weeks until there's only one rapper left standing, whom will be crowned the champion and receive cash, recording opportunities, and other prizes. Blind Fury, from Lugoff, South Carolina (near my hometown; I worked in Lugoff as a teen), won the championship earlier this year. You might have seen Fury rapping in one of the coveted cyphers during the BET Hip-Hop Awards on Tuesday night. That's one of the opportunities the overall Freestyle Friday champion gets, and is what Yung Nut will be gunning for next year. 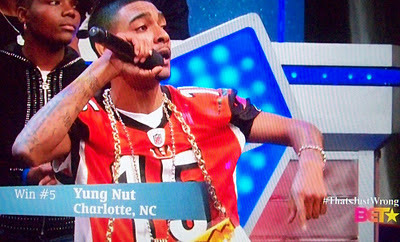 On 106 & Park Friday, Yung Nut wore the late Chris Henry's jersey, and paid tribute to the Cincinnati Bengals player who died in Charlotte during an accident in December 2009. Below are two videos from tonight's Freestyle Friday segment.